The results of our recent parent survey suggests that there are a lot of parents who feel their child needs help with handwriting. We do offer handwriting groups for children at all of our clinics, but you may be wondering what you can do to help. 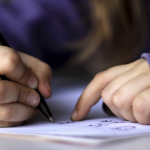 Does your child need help with handwriting? Do they hold the pencil like a drumstick? Can you make out what is on the paper? When Handwriting milestones aren’t developed in the “write” way, you may need some strategies that can help your child.